Since June of last year, I've been working as the full-time Operations Officer for our Security Forces Squadron. However, it wasn't until graduating the Security Forces Officer Course back in May that I actually received the training to enable me to do the job. So here I sit--several months later--still working as the Operations Officer and absolutely loving every minute of it. Since coming home from school, I've taken a team out to the desert for two weeks of field training, gone to Dayton, Ohio for the MAJCOM Challenge trophy presentation, gone TDY to Klamath Falls, Oregon to support the Sentry Eagle open house as the lead of a security detail, and have worked more 60+ hour weeks than I can even count on two hands. And seriously, I love it. 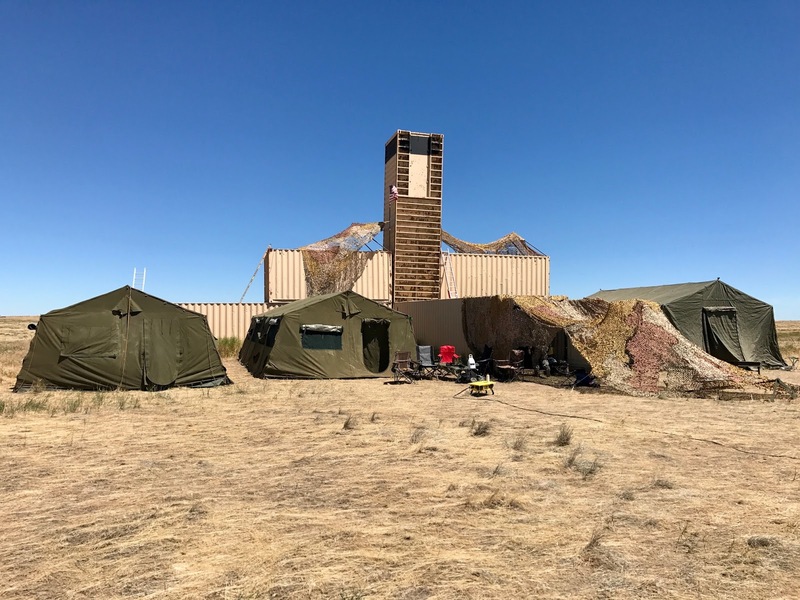 Anyway, today's post is not about how insanely rad AND tactical AND sah-weet my job is, but instead it's to show some of the cool photos of our field training exercise (FTX) we did back in June. 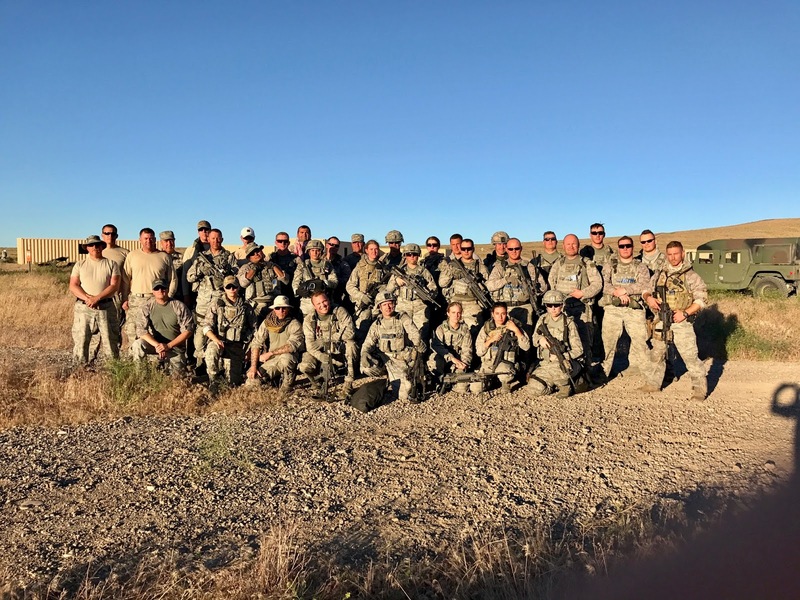 When I got home from school, I transitioned straight into an entire month of work (one single day off), and part of that month was planning and executing a four-day field training exercise out in the Idaho desert for our Defenders. My role in the exercise was to be the Flight Commander for our three flights of 27 total troops. I wrote and presented the Operation Order (OPORD), planned the 3.5-hour convoy to get us to the site, set up a bare base, and then rocked it out in the field with the troops for four days while we held security of our base, ran missions against opposing forces (OPFOR), and had a heck-of-a-time bonding in the middle of nowhere. I mean, when you have no showers, eat nothing but MREs, sleep out in the open air, and have no cell phone connection... what's better than some good 'ol squad bonding? Nothing, I tell you, nothing beats it. Man, I love being a Defender. During the two-week training and prior to heading out to the field, we started most mornings off with squadron PT. 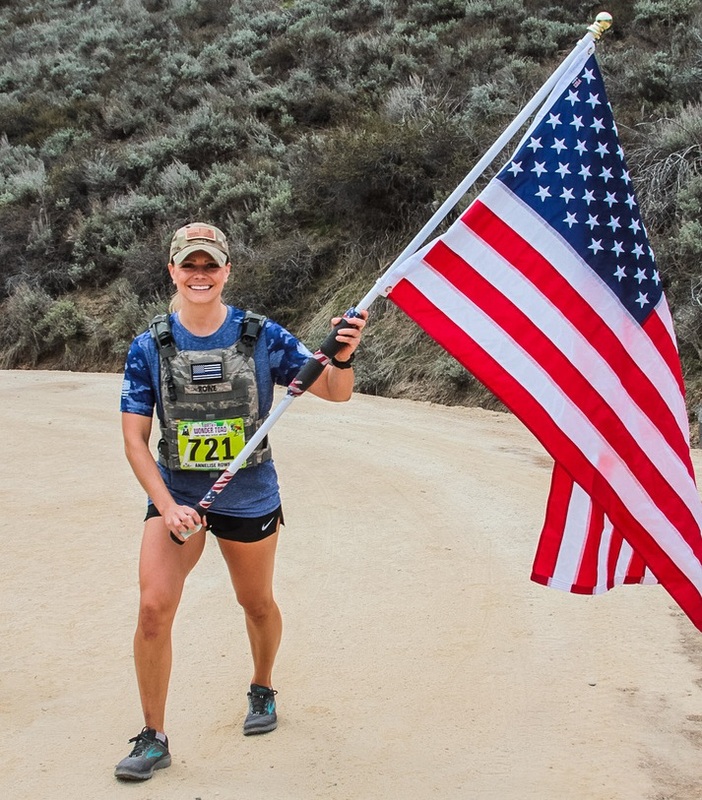 For this session, we hit our range and did log, sandbag and bucket carries up a 200m hill ten times, with sets of 15 burpees & log jumps between each hill repeat. It was a killer workout and we really bonded as a team. Break down the body--build up the resilience--bond the team! 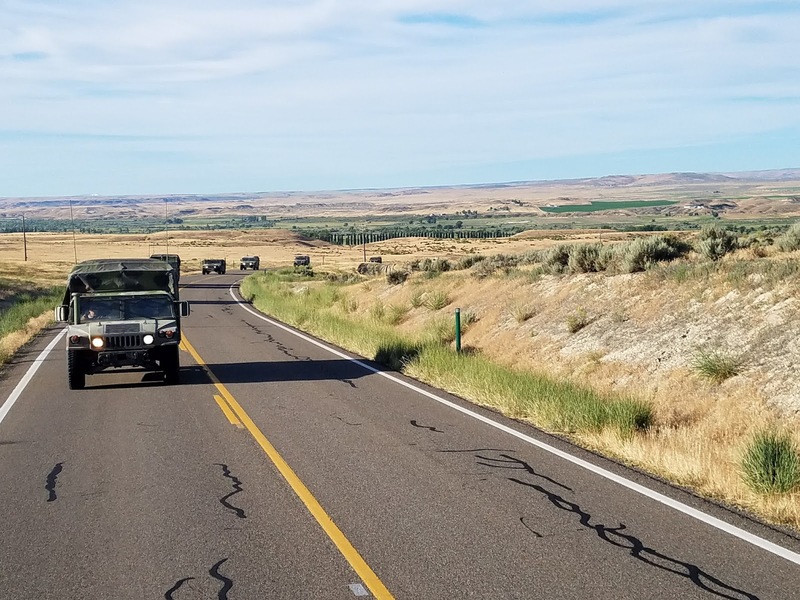 A shot from our lead vehicle of our convoy headed out to the training area. Our convoy was 3.5-hours long. We suffered a broken down HMMWV on the way out, so we had to tow it the entire way. Talk about a wrench in the system! But hey, we made it and it was just one more lesson learned--always have a back-up plan! We set up this bare base around these conex boxes that were out in the middle of the desert at the Saylor Creek Training Area. With the help of a ladder, they provided a place for us to make static overwatch posts and they also provided nice wind barriers at night! We held this camp as well as the base perimeter, which was blocked with C-wire, for four days. 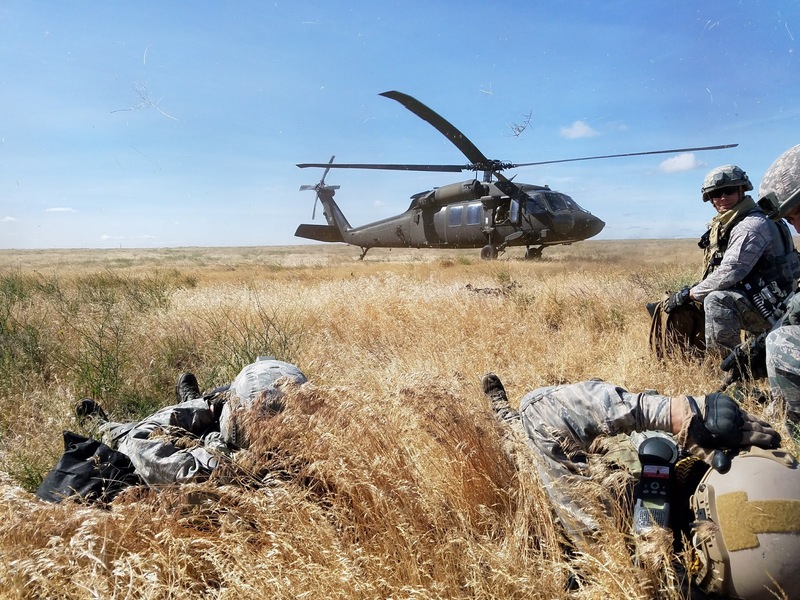 One of our missions/trainings involved a Blackhawk Medical Evacuation (MEDEVAC). Typically, we rehearse MEDEVACs with 9-line cards and radio traffic. 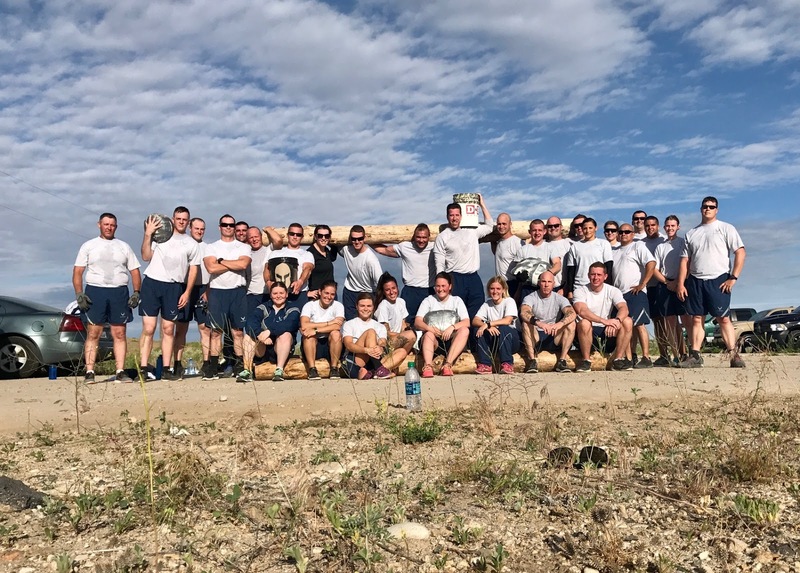 This time, however, Blackhawks showed up to pick up our guys and we were really able to put our SABC (self aid buddy care) and litter carry training to the test. The ride in the Blackhawks was the favorite experience by most of our troops at the FTX. 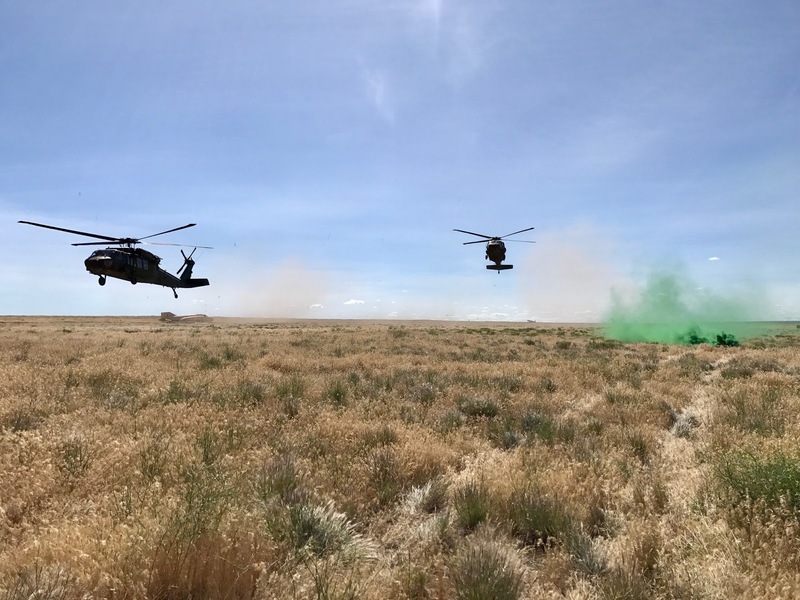 Both Blackhawks landing at our camp after being signaled by one of our troops who popped smoke to signify their safe and designated landing point. 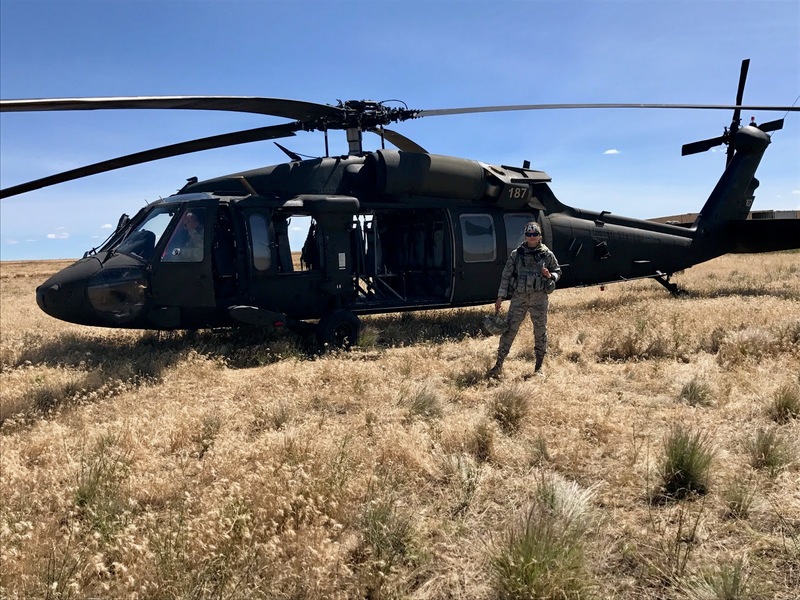 I lead our MEDEVAC mission from our Base Defense Operations Center (BDOC), because I didn't want any of our troops to miss out on the Blackhawk ride. To my surprise, after the mission ended they came back to give the rest of us joyrides who didn't get to go. Just my luck! Our entire FTX flight. What a great group of people this was. This was our flight (Armageddon Flight! BOOM!) and OPFOR members on our last night of training. If the pictures didn't do it justice, check out the video of our training that a visiting troop put together for us. I don't think I can say it enough--I love my job. 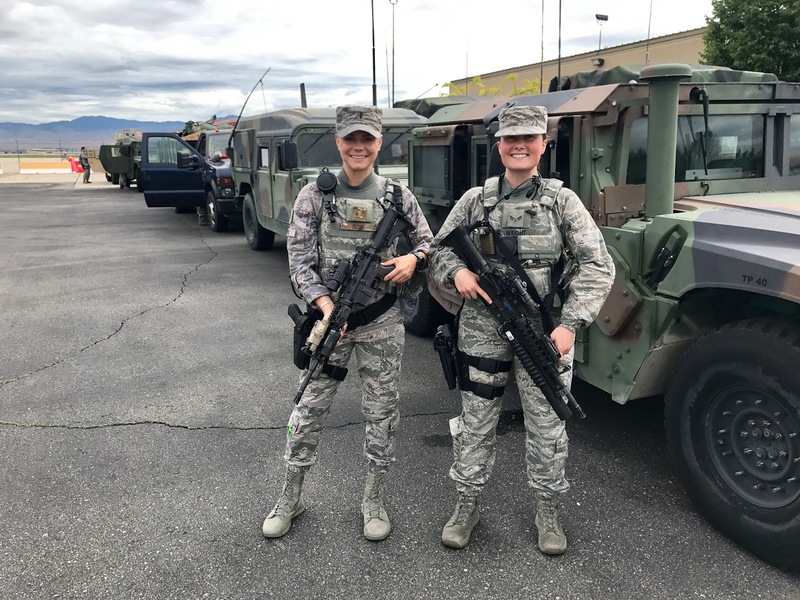 The opportunities I'm being given at the Air National Guard and within Security Forces are more than I could ever have asked for. Every single day brings something new--a new challenge, a new dilemma, a new way to help, a new lesson to learn. The hours are long and the work can be rough, but this job and the people I get to work with make all the difference in the world. As I say every single day (and sometimes it's to remind myself as well--trust me--we all have those days)... "I love my job. I love my job. I love my job!"